Douglas College is one of the largest public colleges in British Columbia, Canada. It is a leader in the field of essential skills and offers programs such as the Essential Skills Practitioner Training Certificate which is a unique six-course program offered in online, face-to-face or hybrid formats. Douglas College funded the Workplace Essential Skills Assessment(WESA) to support its other essential skills related products and training. 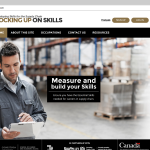 It is designed to help employers, human resources professionals, educators and workplace instructors assess and develop the essential skills that people need for success in work, learning and life.